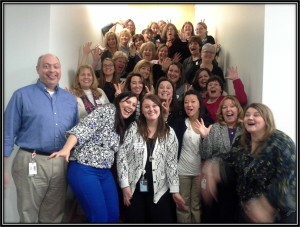 Administrative Professionals Day at Capital One! Leaders literally put their careers in the hands of their executive assistants every day. The exceptional admin serves as the backbone of the organization and helps create seamless, efficient and exceptional success for the leader and the entire team. Sandy Geroux has more than 18 years of experience as an administrative professional, from entry level positions through Executive Assistant for several CEOs. 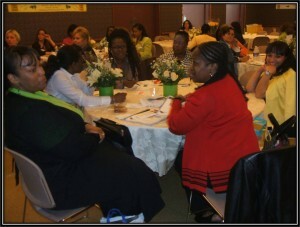 She also has another 16 years of experience training administrative professionals. and find new ways to infuse passion, fulfillment and fun into their position and their career. Her columns and articles appear in many administrative publications, including ASAP, IAAP, Progressive Business Publications’ Administrative Update, and Executive Secretary Magazine. Contact Sandy today to discuss bringing an educational and entertaining program to your administrative staff! … Sandy’s programs to “Support and Train the Supporters”, containing real-life examples from her experience as an administrative professional (as well as the experience of other admins), are for you! Select a complete program below, or do as many organizations do, pick and choose the elements (from among all of Sandy’s presentations) that you’d like to include in a custom-made program that addresses the most important issues for your associates! Thank you for speaking at today’s Administrative Professional Network Luncheon at Pepsico. I especially appreciated your enthusiasm. You are right that it is contagious. I feel more comfortable in my new role here at Pepsico. Your presentation gave me confidence to try and make a difference here in all that I do. I hope to be a “Victor” here and will remember your enthusiasm and try to strive for that level of commitment in my professional life going forward. Thank you again Sandy. I do have to admit the very best part of your presentation was YOU! I felt such a connection to you like I have known you forever. Thank you so much for your wonderful, inspiring presentation and “show”. Your enthusiasm was so needed and welcomed. You made us all feel comfortable and open to new ideas., and we all enjoyed the singing and goodies and everyone thought you and your materials were outstanding and helpful. 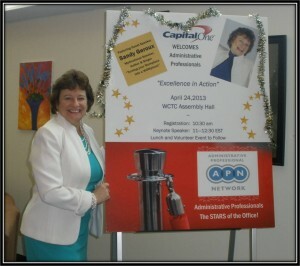 Thank you for making our Admin Professional Day event at Capital One a special one! I so enjoyed your presentation and positive interaction with our assistants. Your energy, good humor, and parody song (loved it!) were memorable and helped to make the message stick. Thank you is clearly inadequate to express, on behalf of the APN network, our thanks for your being with us last Wednesday and presenting to our admins across the enterprise. I, too, am excited to hear feedback from the survey and will definitely pass that along. All in all what we are hearing is nothing less than expected….it was truly a great day in the life of admins across the company! Thank you so very much! I am inspired by you!! Your energy is contagious. I so enjoy your sessions and can’t wait for the next years. You are a natural for sure. Not only are you funny and full of great positive spirit, your content is awesome. I always see things in a different perspective after one of your sessions. You were fantastic! Absolutely fantastic at our Admin Event today. I love listening to you and trying to keep up with your energy! Awesome job. 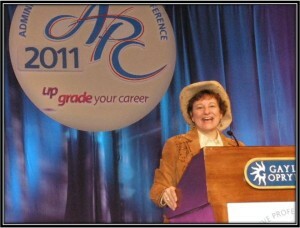 If you’re looking for a program to kick off new intiatives for Administrative Professionals, provide an inspiring keynote, general session or full-day program for Administrative Professionals Week, or offer exciting breakout programs for your Administrative Professionals conference, Sandy is the ideal speaker for you! Sandy can also EMCEE your conference with entertaining and inspiring messages that combine your content and hers to create conference experiences that have attendees raving about long after they are through! The author of many motivating and inspiring webinars for Administrative Professionals. Below is a list of select programs Sandy can present for Administrative Professionals. Choose from the list of programs below, or call Sandy to arrange an inspiring customized program for your organization! Your competence makes you “indispensable.” Beyond that there are mindsets, attributes and skill sets that executives prize in their assistants – features that move you from “indispensable” to “invaluable.” Knowing what your leader is looking for (often before they know), “having their back” by anticipating needs and attending to things they overlook, and acting with the agility and adaptability demanded of executives is as critical to your success as it is to theirs. Direct from executives, get 15 hard-hitting tips, skills and mindsets that they desire and you need in order to stay on top of your game and help your executives stay on top of theirs. Get tools and templates to help you raise your impact to the level of “WOW”! Congratulations! You have been asked to serve on or lead a team at work. You have responsibility and deliverables, but no real organizational authority. Now what? 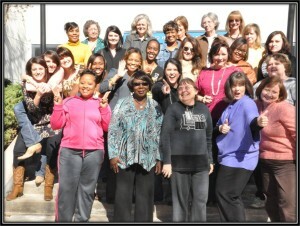 Since the title was invented, administrative professionals have been vested with great power and unofficial leadership. Join Sandy as she shares informal leadership processes that allow you to lead without rank, up down and across the organization. use Indirect Influence to persuade others to act… without ever issuing a directive.. Imagine a world where people understand your way of doing things. Better yet, you understand why they do things so differently from you (and each other) so you know exactly how to communicate with them to build relationships, foster teamwork and get things done. In this webinar, Sandy Geroux will guide us through four personality styles (identified by colors and identifying descriptors) and help us understand the “lingo” that is natural to each style. Through stories, examples and tips, she’ll illustrate how we can bring out the best in each other instead of driving each other crazy! You’ll identify your own true personality style and that of your colleagues, allowing you to enhance your communications and reduce stress – not only at work, but at home and in your communities, as well! build a work culture that honors differences, rather than struggling against them. Creating the WOW for Your Company, Your Career and Your Life! …do what is necessary at this particular moment to make a difference in my own life or the life of someone else? Will I take the action necessary to satisfy this customer? Will I go out of my way to help this colleague, even though I’m tired or in a bad mood today? Will I act according to my values, each and every time I have the chance to make a difference in the life of someone else? If the answer is yes… the WOW will happen for you – and everyone around you. As a society, we’re often taught to avoid risk and focus on playing it “safe.” What we’re not taught is that some level of risk is necessary in order to progress forward, nor are we taught what this level is, how to gauge and leverage it for our own success, and the high personal cost of “playing it safe” – especially in today’s competitive business environment. This program is designed to help attendees create breakthrough performance by learning to think differently about taking risks and realize the critical importance of taking calculated and appropriate risks. They will also discover the factors they will face when deciding to take risks, as well as principles to follow to achieve their goals and gain buy-in from others. Sandy shares personal experience and the experiences of others who have escaped the trap of “playing it safe” to inspire attendees to think more creatively about taking personal and professional risks. With this program, Sandy also helps organizations create a climate that encourages and rewards reasonable and appropriate risk, so employees feel empowered to connect with their values and creativity to produce exceptional experiences for themselves, their colleagues and their customers! Recognize the absolute necessity and benefit of taking appropriate risks in business and life. Identify and mentally prepare for the 4 factors you must fight when deciding to take risks. Learn 5 valuable principles for taking risk, including steps to take to motivate yourself and how to gain buy-in from others whose help you may need/want. Identify and eliminate the excuses you use to hold yourself back, and begin a plan to add more risk in your life to accomplish your goals. Learn the importance of being a positive role model of high personal and professional performance. Are you good at setting goals? Maybe you’re great at it…but do you usually accomplish them, or do they often go by the wayside, like so many New Year’s resolutions? Are you continually setting goals, or “getting ready” to accomplish them…without ever reaching the desired result? Do you feel you’re being held back? We’re all good goal-setters, but how many of us actually achieve the goals we set – especially the big ones? Let’s face it – it’s a Do-It-Yourself World! We must accept personal responsibility for successfully achieving our dreams, or we’ll never reach the desired results. Whatever your dreams, this interactive, hands-on program is designed to help you discover how to effectively make plans to accomplish your dreams. You will learn key principles and tips for doing so by developing the right mindsets, creating a framework and plan to achieve success, and increasing your self-reliance and self-confidence. You will actually begin the path to setting – and achieving – your own personal and professional dreams before you leave this session! Learn 7 critical mindsets and habits of high achievers, and how they succeed. Discover the basics of success and motivation: why we fail; how we plan for success; eliminating instant gratification and other unrealistic expectations; personal responsibility. Learn 10 tips for ensuring goals are attainable – and attained. Learn 5 additional tools, tips and techniques to keep yourself motivated and accountable. Develop action items in “baby steps” to accomplish goals, including deadlines, budgets and monitoring tools to track your progress along the way! In the old days, support staff had limited responsibilities and could focus on one task at a time. No more! Today’s admin typically has not only routine daily tasks, but also undertakes special projects, managerial responsibilities, and teamwork. That’s not to mention the unexpected and urgent things that come up each day. Help is here. This fast-paced session provides realistic techniques for setting priorities, tips on managing time so that the unexpected doesn’t control you, and ideas for boosting your ability to focus and reduce distractions. Discover tools and techniques to help you get more organized. Skills Portfolios have been used for many years in the creative and artistic fields. However, many professionals in other areas are beginning to realize the power of using this invaluable tool to advance their careers, differentiate themselves in job interviews and demonstrate their unique skills. Join Sandy as she shows you how to create an effective physical or electronic Skills Portfolio, how to use it properly in an interview… and how to advance your career – or even create a new position for yourself – within your current company. In this workshop, participants will work with each other to begin thinking about, writing and actually creating their own personal Skills Portfolio before the course ends! Learn the value of a leave-behind item, and how it can be effective utilized. Do you have confidence in your knowledge and abilities when you’re alone, only to have all that confidence and courage disappear in the pressure of a real-live situation? The good news is that confidence is not something you’re simply born with – you can acquire greater confidence by focusing on self-improvement, being willing to overcome fear and take action, and changing the way you think, speak and act with regard to your talents and abilities. Sandy will take you on a journey of self-discovery that will allow you to capitalize on your strengths and help yourself to stores of buried confidence you never knew you had! Identify situations in which you do – or don’t – feel confident, and learn how to capitalize on, or deal with, them. Do you sometimes wonder how certain people receive opportunities that the rest of us just don’t get? How do they position themselves to receive those opportunities – is it just luck, or do they do something special to make things happen for them? If you’ve ever asked yourself these questions, this program will help you realize how to position yourself to recognize opportunity when it knocks, cause it to “knock” more often, and capitalize on it when it does. Learn the importance of taking action to create positive circumstances and opportunities for yourself at work – and in life in general! Sandy offers training programs on the hard and soft skill-based topics below, as well as on Critical Thinking Skills and more. If you don’t see a topic of interest, please contact her to inquire about other topics you wish to present to your administrative professional staff. 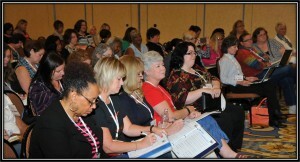 Book them individually or as a monthly, bi-monthly, or quarterly training series! View a full outline of this outstanding program! Leadership does not always come with a formal title. Administrative professionals must be exceptional leaders, with or without the title, in order to do their job effectively, get others on board with organizational objectives and foster teamwork, accountability and loyalty in the workplace. Admin training & Procter & Gamble! Do your written communications make you and your boss look better… or worse as a professional? Your spelling and grammar skills speak volumes in professional settings and if you want to put your best foot forward – on behalf of yourself and your organization – you must master the words and phrases that can either boost your credibility or destroy it. In addition to requiring excellent spelling and grammatical skills, your writing style, concise explanations and interesting style can help make communications clear and enjoyable to read, or create a situation where they are time-consuming to understand and difficult to get through. 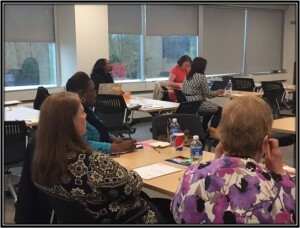 In this workshop, attendees bring sample work products and projects to work on while in class in order to help them use their newfound skills in real situations that will help them boost their writing skills even before they leave the class. Getting organized using templates to help you determine: what is the point and what impact do you want to make? Executive administrative professionals are being asked more and more to speak in public, make presentations, assist with training others and a whole host of other public speaking duties, which reflect not only on themselves but on their organization as a whole. In this workshop, attendees are not only taught basic and advanced principles of public speaking, but they are given the opportunity to speak during the class and be recorded for their own personal practice and educational purposes. Have you ever wondered how some people seemingly “read people’s minds,” anticipate and prevent problems, recover quickly and find fast solutions? As Admins, we’re used to thinking reactively, tactically and logistically in order to solve problems and handle the multitude of details thrown at us daily. But we must also learn to think as strategically and proactively as the executives we serve in order to prevent at least some problems from happening. Possessing 20/20 vision means you can see from 20 feet what average people can see from the same distance. Applying this concept in business, possessing 20/10 or 20/1 means you can “see” things much earlier than most. This program focuses on ways to create 20/10 foresight by maximizing your learned knowledge and applying it to real-life situations, and then on ways to create exceptional 20/1 insight by practicing, mastering and polishing your proactive and critical thinking skills and making them second-nature, in order to anticipate, recognize and prevent problems, as well as minimize and recover more quickly from them when they occur. 5 mindsets and habits proactive people use to get ahead, stay ahead and help themselves, their leaders and their organizations succeed at a higher level. Proven methods for proactive thinking and training your mind to more effectively and consistently apply new learning. Simple tools for using applied knowledge to factor in perceived challenges and be ready to handle them before they happen. Contact Sandy today to discuss a customized and highly impactful program for your organization! If you’d like her to put a “pencil hold” on a date for you, please fill out the “Book Sandy Now!” form and give us the details of your program. Sandy will be in touch with you within 24 hours of receiving this request. See what Sandy’s clients have to say about her programs! "I wanted to let you know what great feedback we are continuing to receive from your keynote at our National Franchise Conference. The lessons learned have been a big hit with our franchise community. It's a real testimonial on your program when months after the event owners are still engaged in implementing the key points you stressed. 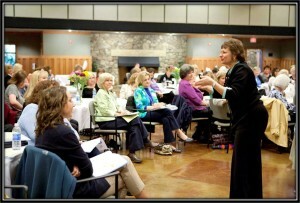 Not only was your presentation entertaining, it is making a positive difference in our business." "Thank you is clearly inadequate to express, on behalf of the APN network, our thanks for your being with us last Wednesday and presenting to our admins across the enterprise. What we are hearing is nothing less than expected… it was truly a great day in the life of admins across the company! Thank you so very much!" "WOW, this was excellent. She kept my interest throughout. Also, challenged us at the beginning to participate in her own way. You would have felt less than you should be if you did not join in. We were very lucky to get this woman." "I just had to send you a note and say THANK YOU for your words of inspiration the past couple of days when you came to P&G and talked to our group of admins. You are a very special person doing very special work, and I appreciate you and the path that led you to where you are – and to us." It takes an entire team to create a WOW - and it all starts with the leader.